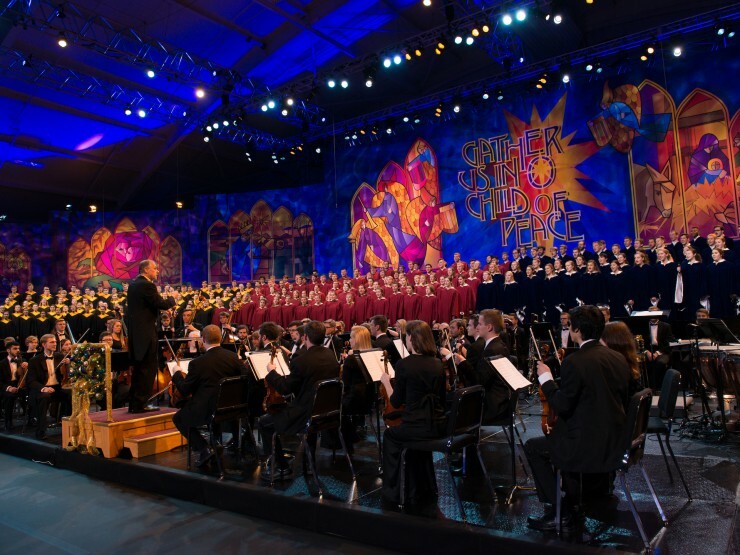 The Emmy® Award-winning Concordia Christmas Concerts are the most beautiful collection of Christmas music you'll hear during the holiday season. 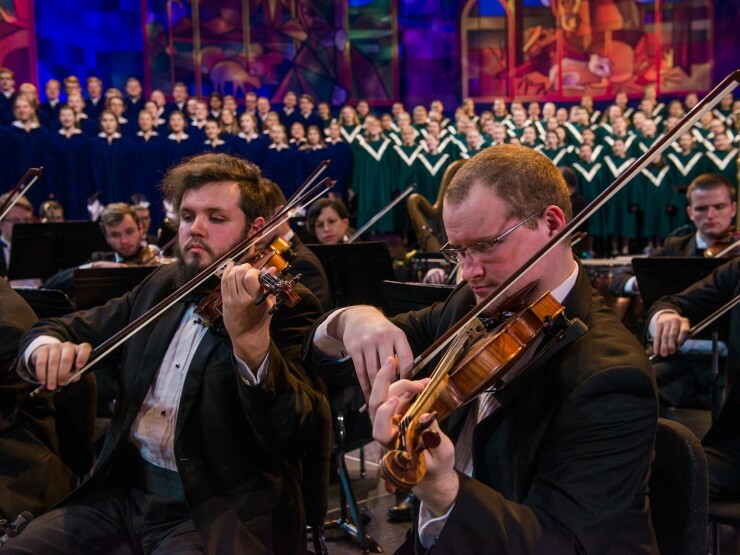 The Concordia Christmas Concerts join approximately 350 singers in four choral ensembles and a symphony orchestra to create the most beautiful collection of Christmas music you’ll hear during the holiday season. 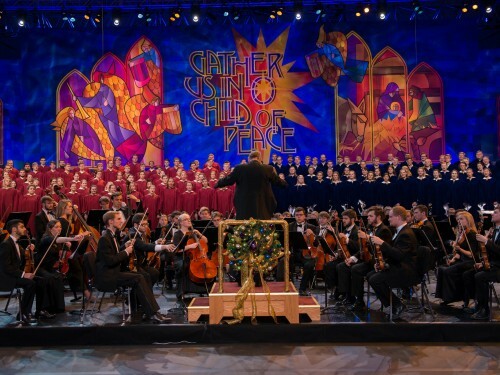 Tickets for both the Moorhead and Twin Cities Christmas Concerts will be on sale at 9 a.m. Tuesday, Oct. 30. The Moorhead Christmas concerts will be performed Friday, Nov. 30, at 7 p.m.; Saturday, Dec. 1, at 2 p.m. and 7 p.m.; and Sunday, Dec. 2, at 2 p.m. Tickets are $22. The Twin Cities Christmas concerts will be performed at Orchestra Hall, Minneapolis, on Thursday, Dec. 6, at 6 p.m. and 8:30 p.m. Tickets are $32, $28 and $23. Join President William and Anne Craft for a Christmas dinner in Moorhead or a Christmas reception in the Twin Cities in addition to the Christmas concerts. 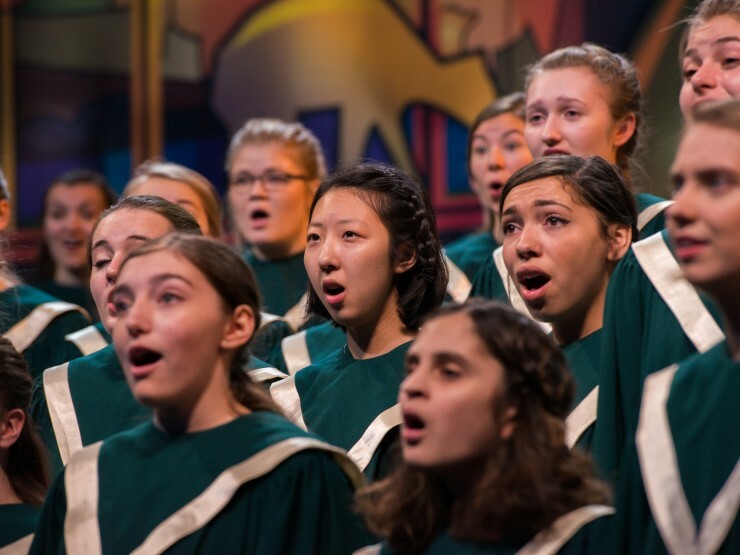 Previous Concordia Christmas Concerts will be broadcast on television and radio this Christmas season. Check your local listings if your community is not in this listing. Recordings are available for past Christmas Concerts. World-renowned composer and conductor Dr. Renè Clausen has served as the artistic director of the award-winning Concordia Christmas Concerts and conductor of The Concordia Choir since 1986. 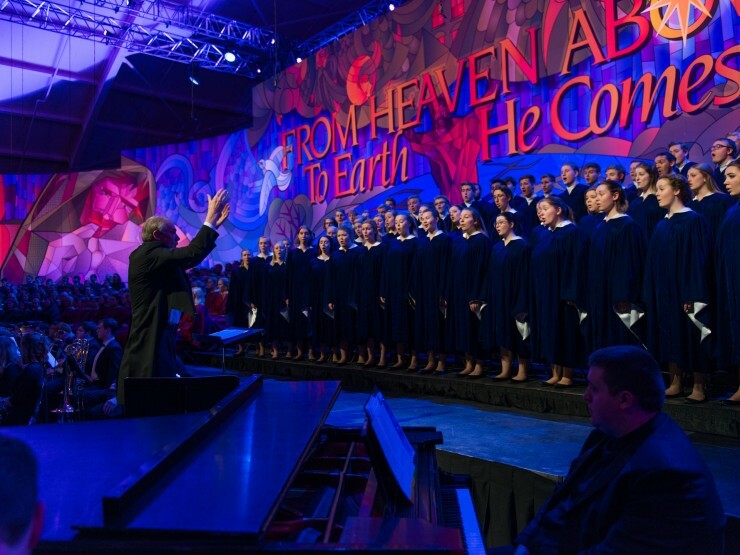 Each year, Clausen composes and arranges a significant portion of the Christmas Concert music. Paul Johnson is a communication art and design instructor at Alexandria Technical College in Alexandria, Minn. He is a native Minnesotan and principal behind Paul Johnson Design & Illustration. Johnson received his education from Minnesota State University Moorhead and was previously employed for 13 years as a corporate artist at Banner Health System, Fargo, N.D. He previously worked as a graphic designer for David Hetland, former artist of the Concordia Christmas Concert murals for 28 years. 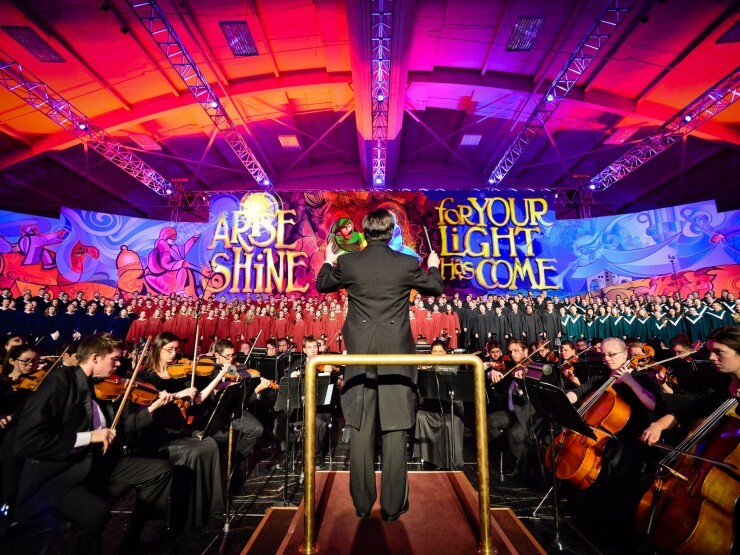 Director of campus lighting since 1991, Bryan Duncan has designed the staging and lighting for more than 400 events. 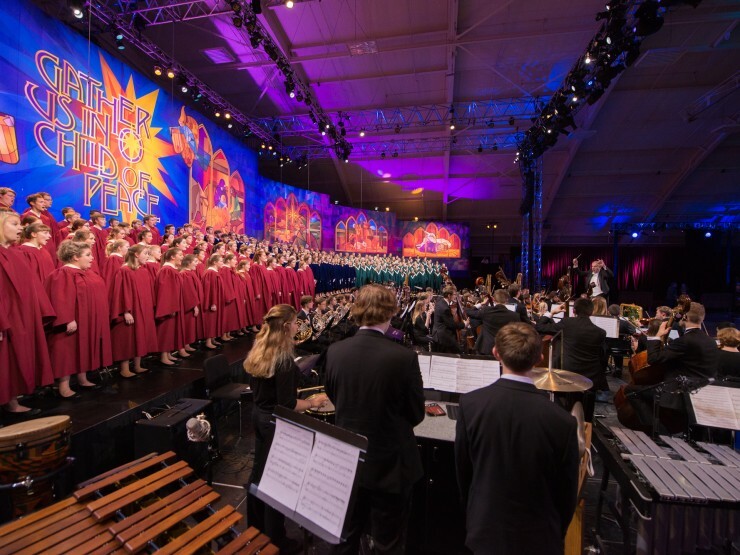 He produced the multimedia display for the 2006 Christmas Concert that memorialized the work of muralist David Hetland. Duncan has received the Meritorious Achievement Award several times from the Kennedy Center American College Theatre Festival and his groundbreaking lighting designs for a 2003 Concordia Theatre production was the subject of feature stories in three national publications. 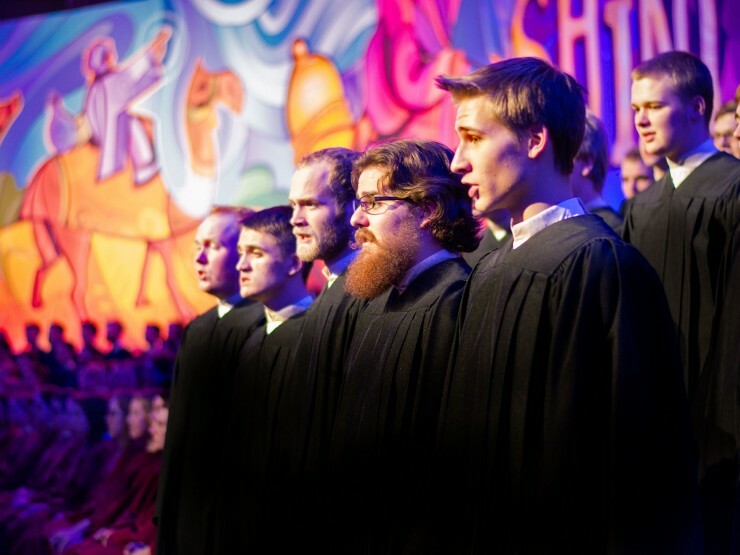 Since 1927, the Concordia Christmas Concerts have become a vital part of life within this institution, the community-at-large and a good portion of the Upper Midwest. Clara Duea, Concordia’s piano and organ professor, organized the Concordia Music Club in 1927 and one of their activities was a Christmas program. The very first concert was performed in Old Main’s chapel, but in 1928 it was moved to Moorhead’s Trinity Lutheran Church. Christiansen joined the faculty at Concordia in 1937. Among his responsibilities was the continuation of the Christmas Concert. This was the same year the concert venue began to alternate between Trinity and First Lutheran in Fargo. Running came to Concordia in 1940 to head the fledgling art department. He had an interest in both art and music and began creating a backdrop for the Christmas Concerts his very first year. The first backdrop was a large blue sheet of sateen behind a single suspended star. He simulated stained glass windows to cover the church’s choir and organ lofts. In 1943, the concert venue was moved to the Moorhead Armory to accommodate the ever-increasing public demand. After the war, with gas rationing no longer a deterrent to travel, people began coming from even greater distances. 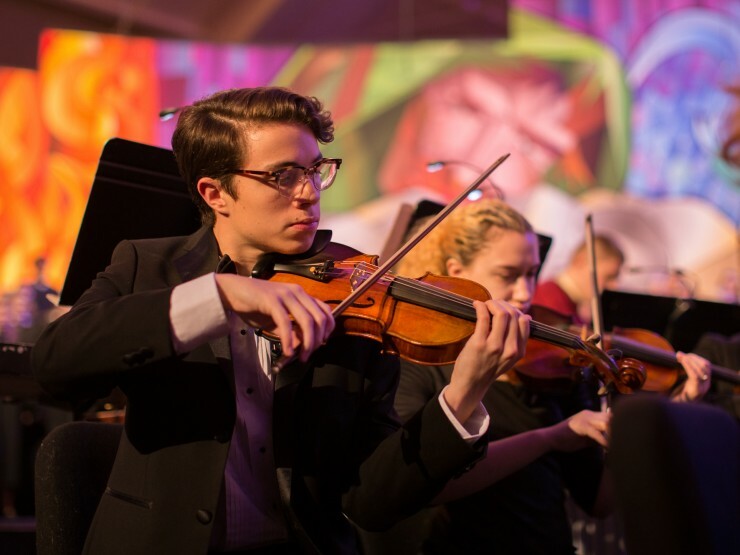 The Forum newspaper once took a survey and discovered that the Concordia Christmas Concert was the single event that attracted the greatest number of out-of-town visitors and generated the greatest economic impact on local businesses. By 1946, three performances were held and within six years five were required to handle the demand. In 1952, Memorial Auditorium was completed and has since been the home of the Moorhead concerts. In 1975, the college took its show to Orchestra Hall in Minneapolis. This was an effort to broaden Concordia’s outreach and to strengthen its ties with a large Twin Cities constituency of alumni and friends. Running’s final Christmas Concert mural was in 1973. He died on Christmas day in 1976 at the age of 62. Christiansen continued with the Christmas Concerts through 1985. Running was replaced on the art faculty by Paul Allen, who designed the Christmas Concert murals from 1974 to 1977. David J. Hetland took responsibility for the art from 1978 to 2005, working first with Christiansen and, after 1986, with Clausen, who succeeded Christiansen on the music faculty and as conductor of The Concordia Choir. In 2009, newly commissioned artist Paul Johnson designed and printed the mural digitally for the first time in the concert's history. This is how the mural is created today. The Concordia Christmas Concerts now include four choirs and a full orchestra. There are four performances in Moorhead and two in Minneapolis. The concert is broadcast on regional radio stations. Approximately every five years, the event is recorded for airing on public and commercial television stations across the country.